Gran Cucina Gourmet Traditional Green Tomato Sauce- Salsa Verde Antica-. Gran Cucina Traditional Fresh Green Tomato Sauce will give a special taste to all your pasta and can be mixed with other ingredients to make an even better tasting sauce. 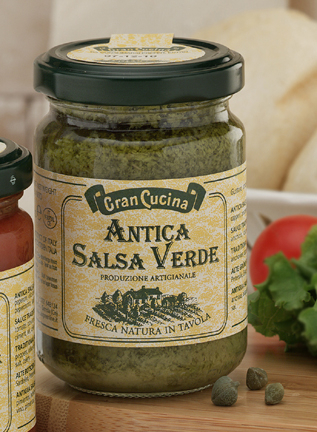 The Gran Cucina Salsa Verde Antica has the fresh flavor of the 100% natural just picked up green tomatos from the Italian fields.